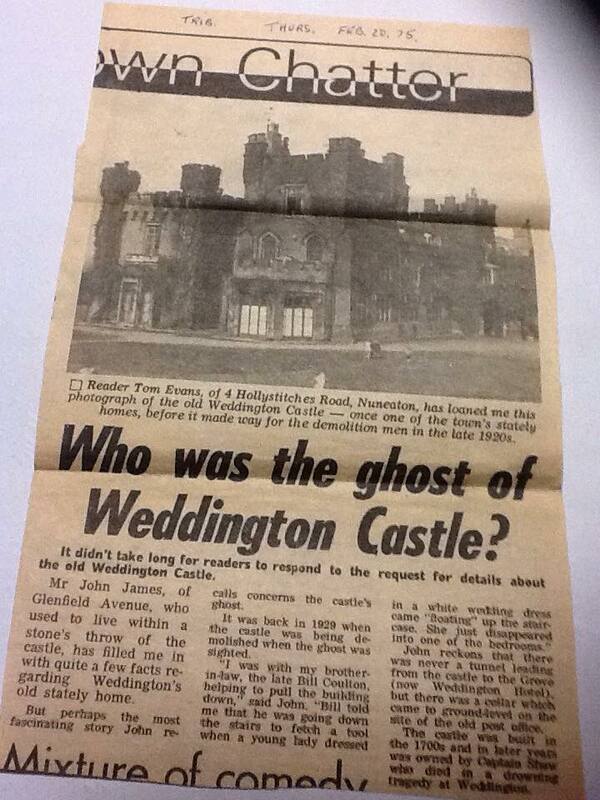 Whilst not claiming any historical accuracy here, the stories below are included as a sample of some of the supernatural accounts that have come to light around Weddington Grove and Castle, as well as other local halls, such as Astley Castle. This story appeared in the Nuneaton Chronicle in 1919 and the editor said a very respectable businessman in Nuneaton, in good faith, gave it to him and it was published without responsibility on the editor’s part. The businessman was a keen fisherman and often went out on lone fishing visits to streams in the area. 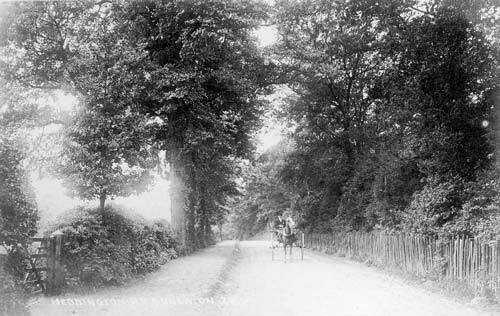 During a very hot day in August 1919 he walked out through Weddington and Caldecote to the Leicestershire borderlands where he dabbled in his favourite pastime. From his newfound companion who appeared as real as you and I he learned that he was talking to a Mr. Burton of Lindley! 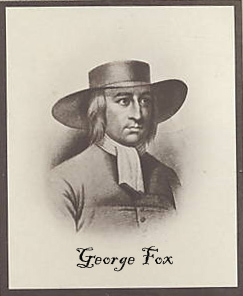 George Fox (1624-1690) born of a pious family, was founder of the Society of Friends, better known as the Quakers. This is a remarkable sighting never having heard of either cycling ghosts – particularly ghosts at a great height above ground level. While I worked there a number of strange things happened, and nobody had an answer as to who was doing them. For example things being moved , knocking and banging and even a figure being spotted on the roof though there was no way up from outside, and the interior doors to the roof were locked and bolted. In my opinion [these were linked to] the newspaper clippings and artefacts found in a small box under floor boards while the pub was being refurbished that all related to a family [Henry Nigel Pole Shawe and family] that once lived in the building before it was turned to a pub. We lived in the former servants’ quarters at the Fox and Crane and there were always rumours of ghosts there. In the part we lived in there were lots of smaller rooms and long corridors. Me and my boyfriend often heard footsteps and whispering in the corridor outside our room in the middle of the night, when we knew no-one else was there. I think it was the ghosts of servants at the Grove. But we were never scared by them, it was actually quite comforting to hear them. When I was a child in the early 1970s, my parents would sometimes take my sister and I down the road to The Grove (or “The Weddington Pub” as it was known then). I remember being fascinated by this imposing building and the dense trees and bushes that adorned the grounds. To a young child this was an ideal playground – especially when added to the treat of a bottle of coke and a bag of salted crisps! On one occasion my uncle, aunt and cousins had come to visit and we found ourselves enjoying a weekend afternoon in the rear beer garden of this establishment. My cousin and I were playing around with a toy aeroplane and I remember that it eventually landed upon a first floor roof at the rear of the Grove, out of our reach. We dared each other to go into the rear door of the building (which was accessible – and hidden from our parents - behind a large bush in the grounds… and unlocked). 1) I have, with the passing of time, often wondered whether my memory of this excursion inside the Grove was merely the over-active imagination of a young child. Recently, over 30 years later, I was fortunate to be allowed into the parts of The Grove not open to the public, having asked permission from the final licensee just prior to its takeover by developers. The stairs, corridor and first floor function rooms were exactly as I recall them. 2) I recall at the time that the young lad seemed strangely – and formally – dressed. It certainly seemed odd for what was then the local pub. It seemed in keeping with the grand interior I had witnessed, but when I subsequently mentioned it to my parents and a member of pub staff that very day, they confirmed there would have been no such staff around at this time. It was not until I saw the pictures of HNP Shawe which were found under the floorboards in 1996 that I recognised the era of clothing this individual had been wearing. This person very kindly tried to regain our aeroplane toy by leaning out of a side window and trying to grab the said item. It proved to be out of his reach and he eventually left down the oak stairwell, promising to fetch a stick to try to retrieve it with. Minutes later my uncle appeared downstairs and angrily called us outside. Needless to say, we never saw the historically attired individual again, and our lost toy plane was never recovered. I offer this memory for what it is worth. There may be many explanations, which refute my interpretation of events (which of course took place many years ago). However, there is one fact that is fresh in my mind. In gaining access to the interior of the Grove just before its closure in January 2008, I sought out the stairs and corridor I remembered from my experience, and found them just as I remembered. More significantly, I found the window onto the rear roof where the toy plane had been lost so many years ago. I would have loved to have opened that window to see if the remains of that lost toy could be seen – however, the window as I found it was sealed shut with at decades of paint over the joints. It could not possibly have been opened for very many years. Yet I can still recall that formally-dressed individual leaning out of that window….. The Headless Airman - during the time when the RAF were based at Lindley aerodrome/RAF Nuneaton, they worked on testing out fog dispersal systems and also prototype aircraft. 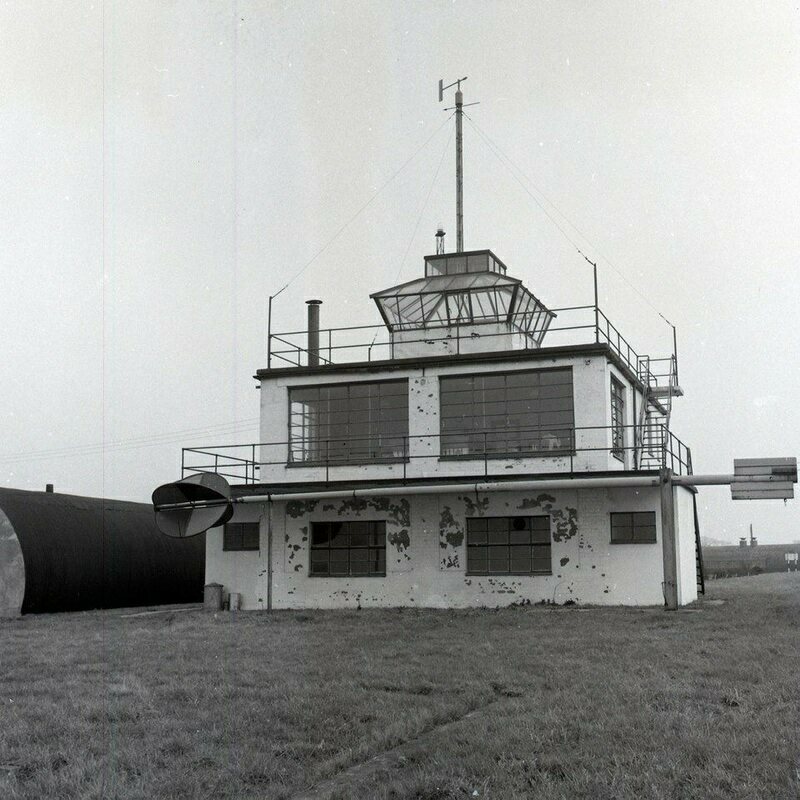 During one of the test flights, the pilot lost control and the plane crashed in the centre of the airfield - now the centre of the dry handling circuit just in front of the control tower. The pilot was killed and there may still be parts of the plane still in the ground. On several occasions test drivers working on the proving ground have reported a man standing at the edge of the high speed track, wearing what looks like a long leather coat. He's usually seen at dusk and has been reported on occasions to have no head. Black Cat - a large Panther type cat has been seen around the proving ground areas. One witness describes how, one Saturday morning when testing on the twin straights, they saw a large creature up ahead, which looked very much like a cat, but as they drove closer it disappeared into the woods. Many other drivers also reported similar events. Never Alone - many people have reported strange goings on in the control tower (which could probably be in line for demolition with the new development work) and the feeling of never totally being alone. Doors closing, muffled talking. Also in the building known as Lindley Grange which appears on the 1841 census housing a large family. This is now used as office space and the building itself must be about 200 years old if not older. People working late have also reported strange happenings and one cleaning lady refused to go in there after seeing someone in the upstairs offices one night. She spoke to the person, who did not reply, so carried on cleaning. After a few minutes she spoke to the person again, but when she looked, no one was there. They couldn't have left the room by walking past her as she was in the doorway area the whole time. She never went into that building again. Astley vicar, the Rev Colin Henderson, who was also vicar of Coton, said he knew nothing of Black Magic rites in the parish. “I am inclined to be cynical about such practices, personally, although I know people can be harmed by dabbling in these things,” he said. Of all the ancient buildings in the local area, Astley Castle is the most reknowned for possible paranormal activity. Whist many fanciful accounts have appeared of 'ghosts' in this area, there have been a series of investigations by the - laudably objective - West Midlands Ghost Club, which have resulted in a handful of events that might possibly be construed as 'paranormal' in origin. Even then, they have never presumed to commit themselves and state that such events were indeed 'ghostly' in nature. It is up to the reader to decide. Click on the link below to find out more on their Facebook page. On the edge of Arbury Park, the home of the Newdegate family for centuries, is the little village of Astley, in the heart of ‘George Eliot country’. There are not many houses, but there is a truly magnificent church, full of interesting things, and behind it the ruins of Astley Castle present a stark and jagged silhouette against the sky line. Here in this out-of-the-way place once lived two of England’s most tragic queens. Elizabeth Woodville spent the impoverished years of her widowhood at Astley after her first husband, Sir John Grey, was killed at the battle of St Albans in 1461, leaving her with two small sons. His estates were seized by the Crown and when Elizabeth pleaded with the King, Edward IV, for their return, he fell in love with her and married her. She became the mother of the little princes in the Tower. After her death in 1492 she was buried at Windsor, and her shade does not linger at Astley. But it is said that Lady Jane Grey, the sad ‘Nine Days Queen’ does! Astley was her childhood home, and here she was happy with her books and her devotions, until her over-ambitious father, Henry grey, Duke of Suffolk, married her against her will to Guildford Dudley, son of the Duke of Northumberland. Upon the death of the sickly 15 year old King Edward VI, Suffolk declared his daughter, Jane, Queen of England, through her descent from Mary, younger sister of King Henry VIII. Jane was but 17, pious, learned, but gentle and unworldly. She was a pawn in the power game played out by Suffolk and Northumberland. Queen Mary, Bloody Mary, marched rapidly into London, and threw Jane and Dudley into the Tower. They were both beheaded on Tower Hill on 12th February 1554. ‘Queen Jane’s Ghost’ is said to have been seen flitting lightly about the ruins of Astley, the place she once held dear. Her father, Suffolk, was also imprisoned, but was released upon the plea of his wife, cousin to Queen Mary. He got himself involved in Sir Thomas Wyatt’s rebellion against the Queen, and he fled back to Astley to hide, taking refuge on a hollow tree just south west of Astley church. One of his keepers, a man called Underwood, brought him food. But Underwood succumbed to the lure of gold, and betrayed his master when offered a substantial bribe. Suffolk was dragged from his hollow tree, and lost his head upon Tower Hill , just two weeks after his young daughter and her husband. It will be noted that whoever put up this stone made a mistake in the date. The 12th February was the date of Lady Jane’s execution. Her father was executed on 23rd February 1554. The castle was later rebuilt, and much of the old building incorporated into the new, which is almost certainly why Henry Grey still haunts it. His ghost has been seen gliding soundlessly from the castle ruins to the spot where his oak tree once stood, where it disappears. A rather macabre turn of events in this story came about in 1849 when a severed head was found in Holy Trinity church in the Minories, Coventry. This was identified, albeit not absolutely, as the head of Henry Grey, Duke of Suffolk. The skin was still intact, and the beard still retained its reddish tones. What was also evident was a certain lack of skill on the part of the headsman, for there were several deep gashes on the neck, obviously made before the final one that lopped the head from the body. The head was exhibited in a glass case inside the church for some time, until the church itself was pulled down. What happened to this extraordinary exhibit after this I have not been able to discover. A reasonable supposition is that it was properly buried somewhere. Often when churches were either altered, restored or even demolished, this kind of thing came to light, and the usual practice was to give such gruesome remains a decent burial. The problem is that there is scarcely ever any record of where or when. Perhaps this is why Henry grey still flits sadly around Astley looking for his long lost head, and wondering if there will ever come a time when it may once again join his body, which would almost certainly have been buried somewhere near the place of his execution, on Tower Hill, and without benefit of clergy. Betty Smith, Ghosts of Warwickshire (pp122-124), Countryside Books, 1992. The ghost of Hartshill is unidentified, but nobody is in any doubt that she is best avoided. Bad luck dogs those who are unlucky enough to attract her attention, though those who are passed by seem to escape without mishap. The phantom lady is seen moving slowly about the ruins of Hartshill Castle, which dominate the northern end of the village. The castle was first built in the immediate wake of the Norman Conquest in the 1060s, when the Normans threw up fortified posts to overawe the English. The earthworks date from this period, with their 18 foot deep trenches and towering mounds. Hartshill Castle was never large, but it was secure enough to act as the headquarters of Henry Tudor, soon to be King Henry VII, before the Battle of Bosworth at which he won the crown. The stone walls that once topped these fortifications were torn down in the 1560s and replaced by a comfortable Tudor mansion. It is this building that is gently falling into ruin, and to which the ghost seems to belong. Her long silk dress and angular headdress point to an Elizabethan date. One witness who encountered the ghost as he walked along the footpath that cuts alongside the old walls said that she came so close to him that he heard her silk dress rustle. Fortunately for him, she passed him by without a second look. For it is her glance that brings bad luck. For centuries the enigmatic lady in black has been walking Hartshill. Then, in 1947, came a startling discovery. As the old ruins were being passed from private hands to those of the Ministry of Works, now English Heritage, some archaeological digs were undertaken. Most of what was found proved to be mundane domestic pottery and rubbish, but one excavation revealed a long forgotten cellar. And in the small, shallow brick-lined cavity lay a badly decomposed skeleton. Is this the last remains of some poor soul done to death long ago in the dank dungeons of the castle? If so it may explain the unquiet wanderings of the lady in black and why she exhibits such animosity to the present-day inhabitants of Hartshill.